We are honored to present the new way of seeing art and its relation to life that we learned from the Aesthetic Realism of Eli Siegel. We see it as the most valuable, exciting, needed approach to art and art education there is. We love it, and we are very glad to tell you about it today. The philosophy Aesthetic Realism was founded in 1941 by the great American poet, critic, and educator Eli Siegel. A central principle which we will illustrate is his landmark statement, “All beauty is a making one of opposites, and the making one of opposites is what we are going after in ourselves.” Mr. Siegel has provided here the criterion for beauty, which we have seen is universally true. And he has answered, too, the question: What has this beautiful thing to do with our puzzling, imperfect lives? In 1955, Eli Siegel’s 15 questions, “Is Beauty the Making One of Opposites?” were published by the Terrain Gallery and the Journal of Aesthetics and Art Criticism. Each of the [talks] deals centrally with one pair of opposites —such as Logic and Emotion, Freedom and Order, Grace and Seriousness, Continuity and Discontinuity—and shows that the technical questions of art, aesthetic questions, have in them the solutions to the conflicts in our lives . On a visit to the Metropolitan Museum some years ago, I saw the two-panel screen painted by the 18 th-century Japanese artist Sakai Hoitsu. I felt it was beautiful, and couldn’t take my eyes off it. I was deeply affected by the simplicity of the composition and by a richness of detail that was so satisfying. I am grateful to Eli Siegel and Aesthetic Realism for stating the questions which can have a person see centrally what makes a work of art beautiful, and how we want to be in our own lives. Is there a simplicity in all art, a deep naiveté, an immediate self-containedness, accompanied perhaps by fresh directness or startling economy?—and is there that, so rich, it cannot be summed up; something subterranean and intricate counteracting and completing simplicity; the teasing complexity of reality meditated on? 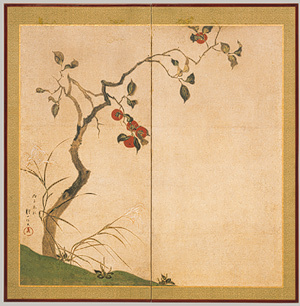 The artist paints a single autumn tree with its few remaining leaves and five persimmons sharing a wedge of earth with two graceful grasses and three other plants, all against a subtly luminous background. I love those bold persimmons with their full, ripe weight, and glowing energy—you can almost taste their sweet, astringent flesh. In their round red forms, luscious, immediate and so abstract, and in the graceful turnings of the leaves, you feel the “fresh directness” and “immediate self-containedness” Mr. Siegel describes. I also love the brushwork—there is a careful swiftness in the blades of grass, the leaves, and in the individual branches of the tree. It has an economy that is startling and thrilling. See how a single brush stroke forms a blade of grass and can show it turning, coming to a point, becoming space? It is lovely! Through looking at one thing deeply and trying to be fair to it—this lone autumn tree—Hoitsu shows that one can get to the fullness of reality itself. wants to have herself “definitely,” unstainedly, unalloyedly. Her unconscious feels that the only way to have herself unpolluted by externalities is to deny externality; spurn it, put it out of her life, even annihilate it. Still...in Miss Rawlins mind, as in other minds, there is a co-existent tendency towards manyness, the heterogeneous earthiness of things. Hilda isn’t calm about this tendency, either; for she sees it as the enemy of the tendency towards unity, and doesn’t want to see the two tendencies together. I learned from Aesthetic Realism that the solitude I sought in nature could never satisfy me because it was based on contempt for the world and people, and was directly opposed to my deepest desire: to like the world honestly by seeing meaning in it. I am very grateful that through studying Aesthetic Realism, first in consultations and now in magnificent classes taught by the Class Chairman Ellen Reiss, I am learning to see the world and people truly, as adding to me and deserving my full respect. It has made for a composure and excitement about life that is so new. I was thrilled to see in looking at Hoitsu’s painting with my wife Bénédicte Caneill, that the composition of his two-panel screen has the answer to this fight in a person. The two halves of the screen are so different—the lefthand side is more complex and crowded, and the tree, grasses, and plants are all joined in the patch of earth. On the right panel, the composition is quite spare and simple: the upper limb of the tree is very separate from the small plant at the bottom, and even continues beyond the top edge. Yet the two panels together don’t fight, they make a pleasing, unified whole. This is how I want to be! Look at the trunk of the tree, so graceful, yet gnarled and jutting, too, as it twists and turns. There is a sense of struggle, opposition—”the subterranean,” as Mr. Siegel says, “counteracting and completing simplicity.” And I love the branch that recedes from us, painted in a lighter wash of color. It has mystery, drama, and humor—from its delicate twigs hang those large, ripe persimmons! And there are those lovely grass plants that assert and yield. Along with their graceful simplicity, we feel what Mr. Siegel wrote, “the teasing complexity of reality meditated on.” And we feel this, too, in those wonderful persimmons, so bold, yet delicately subtle in their coloration and outline. Look how each is partially hidden behind the leaves. Yet this teasing is not for the purpose of making fun of people and things as mine was. This teasing makes for more wonder about the whole world. Following the line of the tree trunk, and looking from leaf to leaf, we feel a surprise and richness—”that cannot be summed up”—at one with graceful and spare simplicity. Look at the way the leaves curl forward and back, showing both top and underside, and enclosing space that you can almost reach into. With great subtlety the leaves show the possibility of matter—as hidden and shown, dark and luminous, similar, yet individual and so different. Before meeting Aesthetic Realism, I used surface against seeing the depths people have. I snobbishly judged people by their social background, education, how they dressed. Unlike Hoitsu, who so lovingly looks at the surface and undersides of these leaves, I preferred to stay on the surface, not see what was below, the complexity and depths of people—their hopes, fears, desires. I went for importance through lessening meaning, which I learned from Aesthetic Realism is contempt, and completely opposed to the purpose of art. Hoitsu as artist is important because he wanted to honor meaning, to show through surface the depth and complexity reality has, and the result is beautiful. I love Aesthetic Realism for the life I now have, and for showing that within art are the answers to the deepest questions of a person. And I am grateful to be learning more through this beautiful painting by Sakai Hoitsu—through its composition, technique and details—that seeing and being honestly affected by the depths of reality—and that includes the depths of another person—makes for true happiness and pride. There is no greater message for every person. David Salmon was born in Nashville, Tennessee, where he attended Montgomery Bell Academy. He has degrees in Art History from Bowdoin College and Architecture from the University of Tennessee, Knoxville. After moving to New York City, he began studying Aesthetic Realism in consultations. In 1988 he became an Aesthetic Realism Associate and studies in professional classes taught by Class Chairman Ellen Reiss. Along with art talks Mr. Salmon gave in the series “Art Answers the Questions of Your Life,” he also participated in the public seminar “The Fight within Every Architect —About Beauty & the Failed Economy ” and has given reports of Aesthetic Realism classes, including of the landmark class in which Ellen Reiss spoke on the great meaning Architecture has for every person’s life. This report was published in the international journal The Right of Aesthetic Realism to Be Known, #816. David Salmon is Director of Facilities and Space Planning for the New York City Department of Education. He has worked on the design of over 25 new public school buildings in the city and surrounding suburbs. He lives with his wifeBénédicte Caneill, an educator and textile artist, in Larchmont, New York. He is an avid bird watcher and accomplished flutist.